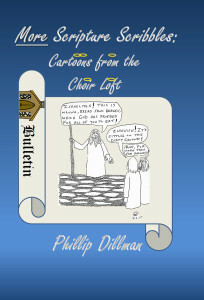 This week, my guest was cartoonist Phillip Dillman author of Scripture Scribbles: Cartoons from the Choir Loft and the just released More Scripture Scribbles: Cartoons from the Choir Loft. (both from HOPress-Shorehouse Books and available on Amazon.) If you need a Christmas gift for the faithful with a sense of humor–or maybe those without a sense of humor as these books will give them one–these cartoons are a great idea. I love talking with Phil about his artistic process which amazes me in that he conceptualizes the idea and “scribbles” his cartoons during the sermon–a period of about 15 minutes. To me, this is sheer genius! 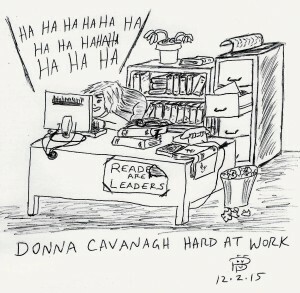 Anyway, a fun interview and within MINUTES of the broadcast, he sent me my own cartoon which you will see below. This artwork is now framed and on my office wall. Phil Dillman was born and raised in Homewood, Illinois. His parents went to church regularly at First Presbyterian Church of Homewood, with Phil and his sister, Laura, regularly attending Sunday School. Phil remembers some of the drawings he did during that time, one being an erupting volcano. This was inspired by the topic of creation. He was thrilled when the drawings done by the kids in the class were projected onto the wall of the sanctuary during a church service later in the year. There, as big as life, was his image of a volcano spewing and streaming molten lava down its sides. That was cool! 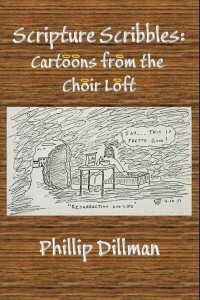 Nearly forty years later, Phil sings in the choir and finds inpiration for his drawings in the scripture lessons or the sermons. Many of the drawings are humorous (at least to Phil) while some are a bit more serious. Some of the references are obvious while some are a bit abstract or absurd. Either way, it is hoped that everyone will enjoy the book and not be offended by any of it. By the way, Phil really is listening to what is being said during the service! Phil is a truck driver during the week and is the Editor of two quarterly newsletters; one for the Pepsi-Cola Collectors Club and one for the Dillman Family Association (genealogy). He co-authored a book on Pepsi Memorabilia in 2000.